Date: 04-12-2018 Concluding the European Biodiversity Conference, hosted by the member of the European Parliament Mr.
Subject: The Belleuropa Award recognizes the exceptional initiatives undertaken by private land managers and public-private partnerships in preserving local wildlife. It promotes sustainable business models based on responsible agriculture, rural tourism, and the promotion of low-impact products or activities. Mr. Andrea Marazzi, owner of La Ronca estate -labelled Wildlife Estate-, received Belleuropa Award 2018 on behalf of his territory. La Ronca is a private estate located in the central area of Spain. The owner is dedicated to a management model that promotes the conservation and the improvement of the biodiversity, preserving the traditional land uses. The estate covers 850 ha with many different Mediterranean habitats. The largest in terms of surface is the “dehesa” -the typical open Mediterranean forest with pasture, so rich in biodiversity- with centenary evergreen oaks (Quercus ilex), that combines in perfect harmony different land uses including sheep and the collection of high quality honey from nomadic hives. The mosaic of different crops; cereals, olives, fruit trees and vineyards, shape the landscape and provides refuge and food for many small vertebrate species such as rabbits and partridges, the base of the chain food for the most endangered predators as the imperial eagle, which can be seen at La Ronca. On the southern boundary the property borders with the Alberche river, which is included in Natura 2000 for the habitats and flora present in the riparian forests. Thanks to the permanent surface water; alders, ash trees, and other accompanying vegetation serve as connector and corridor for wildlife like otters and many protected fishes. Location: Residence Palace; Brussels; Belgium. Subject: Butterflies and moths are declining seriously in most countries across Europe. Action is needed urgently at a European level to halt their decline and restore a countryside rich in butterflies, moths and other wildlife. That is why Wildlife Estate (WE) Label is considering to collaborate with Butterfly Conservation Europe (BCE) in monitoring insect population dynamics and recommending territory management actions at detail for improving and creating meso- and macrohabitats suitable for these insects. For each part better understanding each other's procedures and methodologies, Mr. P. Crahay hosted a meeting between Dr. D. Maes -senior scientist at the Belgian Research Institute Nature and Forest, and collaborating with BCE- and European Landowners' Organization personnel. The meeting consisted in a demonstrative session for Mr. T. de l'Escaille -ELO secretary general-, Mr. G. Gil -WE coordinator-, other ELO project developers and Ms. V. Vandenabeele -Landelijk Vlaanderen-. The procedure for sampling butterflies carried out by BCE was confirmed to be fully scientific and any person with good knowledge in butterfly species is suitable to do undertake it. 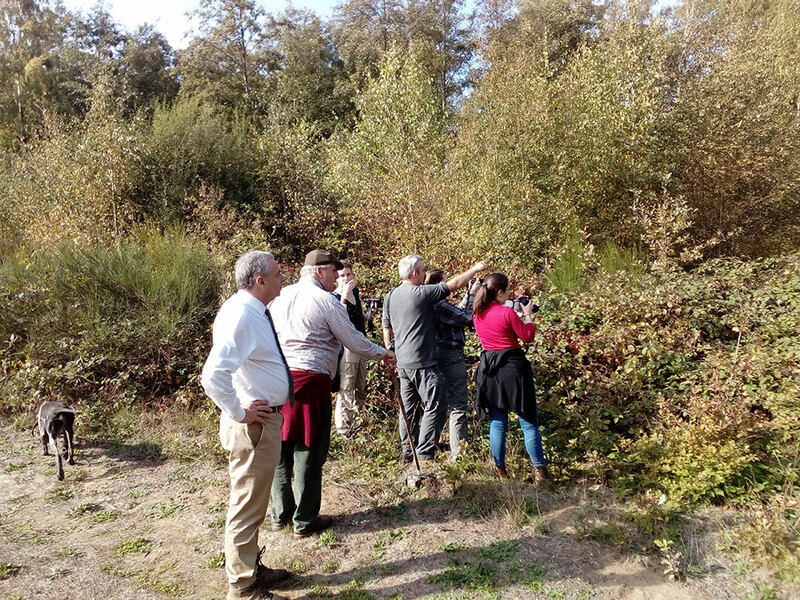 The impressions were excellent and much cooperation is foreseeable between Wildlife Estate Label and Butterfly Conservation Europe in our common goal: acting for biodiversity. 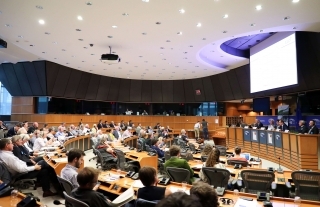 Subject: A special event was organised in European Parliament by Italian S&D MEP, Renata Briano and the European Landowners' Organization, which gathered together 120 participants from a diverse range of fields to discuss the Wild Boar population in Europe: the trends and challenges. 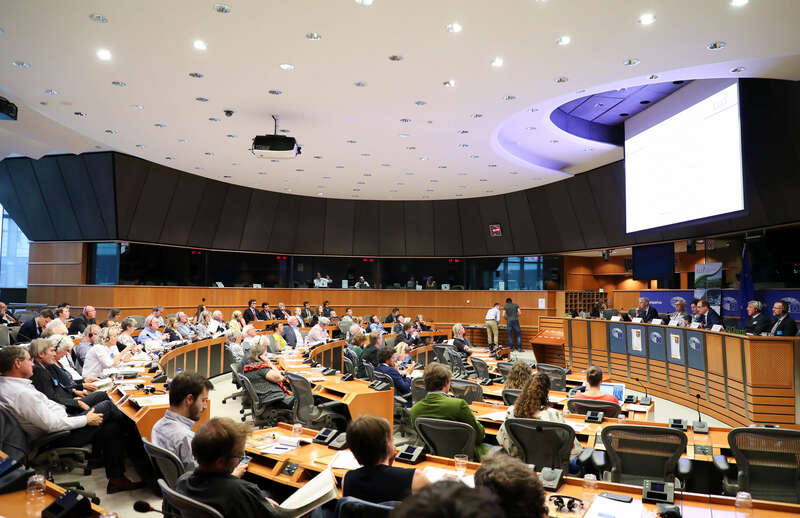 MEP, Renata BRIANO underlined the significance of the growing wild boar populations to large segments of society including farmers, hunters, landowners, environmentalists and the scientific community. Wild boar populations have undergone a systematic increase, in both size and distribution range, across most parts of Europe over the past 30 years. This large, adaptive mammal is causing significant damage to crops and forested areas, affecting biodiversity and ecosystems, and is increasingly becoming a danger to motorists. The new report, authored by ELO scientific Director, Dr. Jurgen TACK, fills a gap in the current research, giving a comprehensive overview of the wild boar populations which was entirely lacking until now. It is based on 550 peer-reviewed scientific papers and proposes a number of policy recommendations to decrease the number of negative human-wild boar interactions. At the same time, it calls for a stronger scientific support of existing and future manage­ment practices. Stefan LEINER European Commission, Head of the Biodiversity Unit, stated that an increase in wild boar populations can also be damaging to ground nesting birds and mammals in Natura 2000 sites which are protected by the EU Birds and Habitats Directives. He called for the restoration of resilient and biodiverse ecosystems in line with the EU Biodiversity Strategy as the best and cheapest way to counter such events which are a result of changed agricultural practices combined with climate change. Subject: Participants at the Regional Forum for the Future of Agriculture (FFA) in Helsinki, Finland, hosted by the European Landowners' Organization (ELO), Syngenta, Maanomistajain Liitto (Finnish Landowners’ Organisation), convened on June 13, 2018 to continue the discussion on the nexus between sustainable farming practices, healthy food and the environment. Every year, the FFA in Brussels and its regional events emphasize the need for governments, civil society, the private sector and all other stakeholders to work together in order to deliver both food and environmental security. 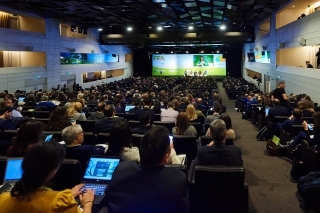 Each year, two FFA Regional Events take place in different locations all over Europe to connect up close with local environmental demands and agricultural conditions and to provide further input for next year’s main stage in Brussels. 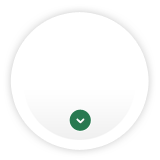 In Finland, agriculture has to deal with tough climatic conditions including severe winter, short frost-interrupted growing seasons and relatively scarce and acidic arable soils. Although Finland relies heavily on food and other agricultural imports, it has seen an increase in demand not just in these categories, but also for food and agri-business opportunities as well as tourism. These regional demands have partly been generated by structural reforms and the development of Finland’s rural economy. While the country is keeping pace with Europe in terms of growing cities, the above-mentioned growth in rural opportunities mean that its agriculture remains attractive. However, Nordic countries must also ensure that economic growth and farm practices are shaped in accordance with the UN’s Sustainable Development Goals (SDGs). Food security and quality, climate change and a liveable planet are foremost among those affected by rural development. During FFA Finland, the first panel discussed the bridge between farm practice and the SDGs, but also important local issues such as trade with the Russian Federation. The third panel was dedicated to the sustainable management of natural resources, combating climate change and biodiversity loss which do not just threaten biodiversity but also have a negative impact on farming. FFA Finland discussed how land managers can remain profitable while increasing environmental goals and attracting a new generation of farmers. After the great success of #FFA2018 in Brussels, the Regional Event in Finland continued the serious debate on the future of agriculture and the environment while paying attention to the unique circumstances of Nordic land management. Join us for our Annual Conference in the exquisite Bückeburg Palace! 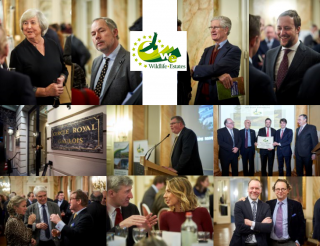 The Wildlife Estates Label is the largest private conservation label in Europe and each year we invite all those who support our work to attend a high-level conference and field trip to share best practice in private conservation and wildlife management. This year we are delighted to be holding our annual Plenary Conference in Lower Saxony, Germany. 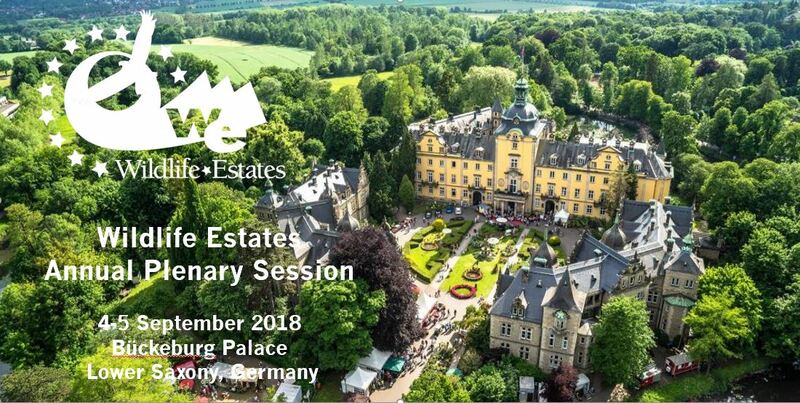 Our host is Wildlife Estates member, HSH Alexander Prinz zu Schaumburg-Lippe, will kindly open his estate to Wildlife Estates members and friends. In this framework, we are organizing a seminar dedicated to the issue of ‘Wolves in Europe’ with high-level speakers including representatives from the German Bundestag, EU Large Carnivore experts as well as sheep herders and landowners. A second panel will address the need for compensation for private conversation and we are honoured to have Mr Humberto Delgado Rosa from the European Commission to discuss the issue. The conference provides a forum for land-owners, land managers, and NGOs, as well as national and regional authorities, to share their experiences of private nature conservation and wildlife management. Participants can expect lively debates on both the challenges faced by private landowners, as well as the benefits of their contribution to society through biodiversity conservation. EU Biodiversity Conference 2017 - "CAP Reform: Opportunities and Threats for Biodiversity"
The European Biodiversity Conference is an annual high level conference organized by the ELO. The conference gathers land managers, landowners, policy makers, NGOs and industry representatives to discuss the participation of land users and land managers in the protection of biodiversity, as much as agri-businesses and industries, from different angels. The conference will be focusing on the future strategy on food and farming and its environmental impact. In the context of the CAP reform and the EU Action Plan for Nature, People and the Economy, we would like to address the issue of biodiversity management confronting agricultural policies and practices. 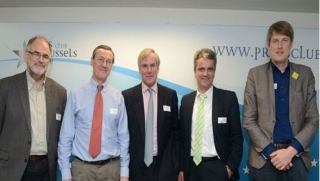 How can the future CAP answer better environmental challenges? Where in its architecture and priorities should be included climate and environmental objectives? How to redesign policies in order to fully reward farmers for the delivery of public goods and their ecosystem services? 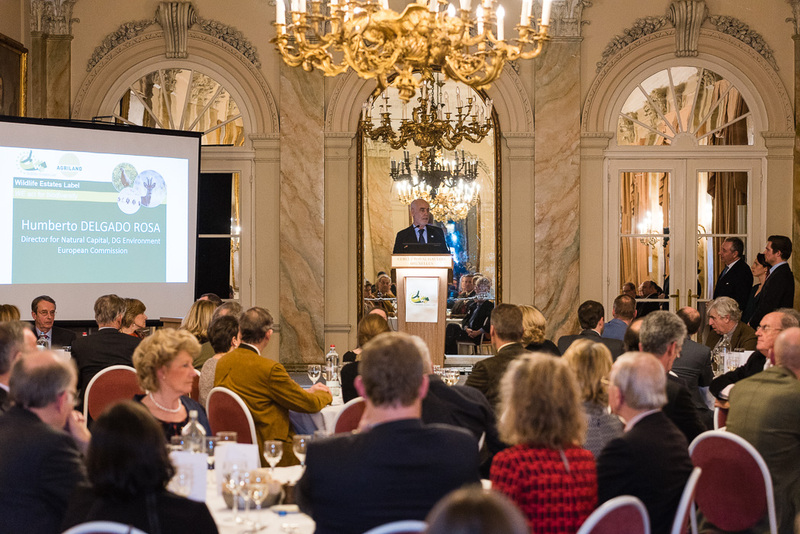 Every year the conference hosts the Belleuropa Award that honors a Wildlife Estate Label territory which has realized an important step forward to maintain, protect or improve land for the benefit of biodiversity, using agri-environmental measures and achieving significant results from an environmental point of view. Subject: On the 19th – 21st September the national delegations gathered in Bucharest, Romania for the 12th Plenary Session of the WE Label Steering Committee to discuss progress in the project. The network now counts over 280 estates covering a total area of 1.500.000 hectares. 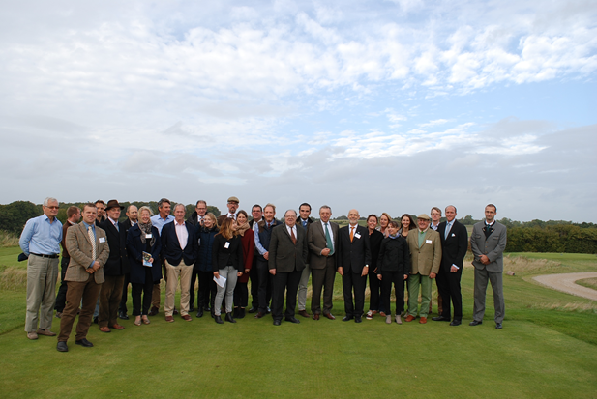 Panel debates highlighted the importance of integrating biodiversity into the Common Agricultural Policy (CAP) reform, while also maintaining the balance between biodiversity conservation and the interests of landowners and land users. Key concerns included ensuring that adequate dialogue with stakeholders is sought prior to the creation of management plans, as well as when working with stakeholders in regions co-existing with large carnivores. The subject of financial burden-sharing was also addressed. Many speakers called for the recognition of nature and biodiversity as public goods, from which society as a whole benefits, and to which society as a whole should contribute. 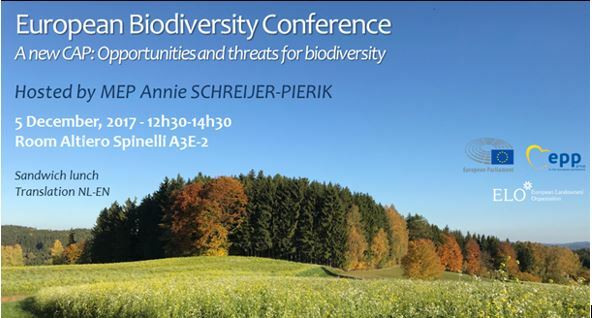 EU Biodiversity Conference 2016 - "Biodiversity-friendly Farming: Is Organic the Future"
Subject: The European Biodiversity Conference is an annual high level conference organized by the ELO since 2010. The conference gathers land managers, landowners, policy makers, NGOs and industry representatives to discuss the participation of land users and land managers in the protection of biodiversity, as much as agro businesses and industries, from different angels. 2016 - "Biodiversity friendly farming: is organic the future?" Subject: On the 27th – 29th September international experts for wildlife management and the national delegations gathered in Køge, Denmark for the 11th Plenary Session of the WE Label Steering Committee to discuss progress in the project, exchange experiences and validate the new WE Estates in various countries. In Denmark 26 further Estates joined the Wildlife Estates – network, increasing the total number of estates under the label to 231 covering a total area of 1.135.000 hectares. 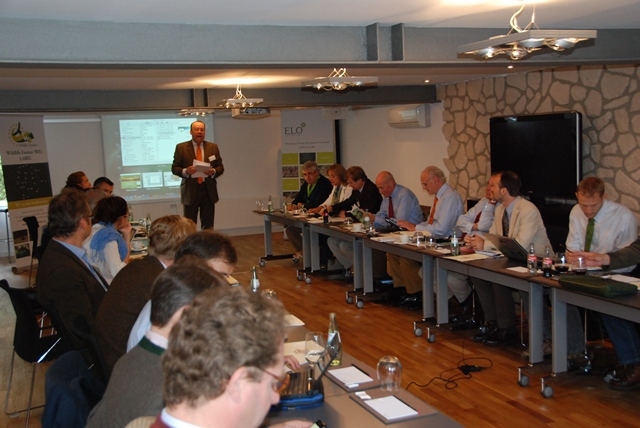 The seminar “Managing Europe’s wildlife and its natural environment” provided fruitful discussions between various stakeholders of wildlife and nature conservation management. Humberto DELGADO ROSA, Director of Natural Capital in DG Environment, European Commission, stated that private land managers deserve a full recognition of their role in nature conservation. Jurgen TACK, ELO Scientific Director & Landelijk Vlaanderen reported of the scientific evidence that hunting contributes to conservation through balancing the peaks and slumps of population from prey and predators. Participants of the Plenary Session were invited to visit the Ledreborg and Gisselfeld estates to see their wildlife- and landscape management. Ledreborg is an estate of 1.600 hectares in the centre of Zealand’s only National Park. It was listed under a national landscape preservation order in the 1970’s. The Gisselfeld Estate consists of 4.000 hectares distributed between forest, agriculture, meadows, lakes, and wetlands. 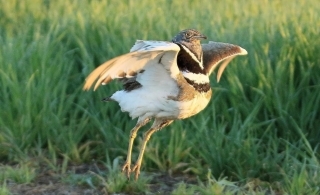 Game and nature have optimal conditions thanks to artificially created biotopes, hedgerows and game crops. Grass strips and beetle banks were cultivated to extend habitats for pollinators. It has been ten years since a group of key players in the field of wildlife management decided that our natural capital is as much a concern for private individuals as it is for society. What private owners do out of love for their estates have a tremendous contribution to maintain healthy ecosystem and thriving biodiversity thus creating prosperous countryside businesses. However it is not enough. We need to ensure that their successes are visible, that their efforts are validated, and that they are, rightly, seen as strong guardians of nature. The Wildlife Estates Label serves as a tool to quantify the estates and to showcase that the private nature conservation that respects Europe’s traditions and economic activities, is often cheaper, better, and easier than the public alternative. 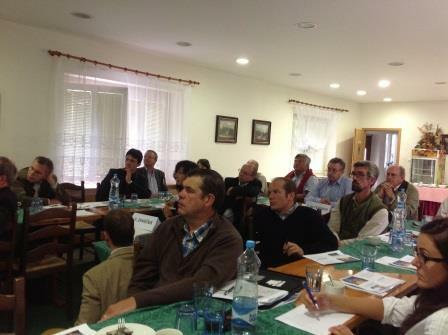 Today, the network consists of 187 European estates covering 1.000.000 hectares. Over the 10 years of operations of the programme, and starting from 2007 for which we first have data, the amount of labelled hectares passed from a mere 23 000 to more than 1.000.000 (count the estates that are undergoing evaluation), which suggests a cumulative rate of increase of over 4 000%. 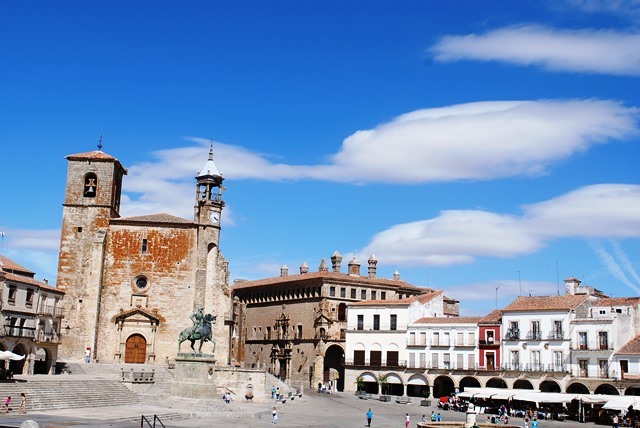 To celebrate this outstanding achievement and to set new targets the WE National Delegations gathered together in Trujillo, Spain between September 14th - 16th. The plenary session included a half day conference entitled “What benefits does the Wildlife Estates Label bring to landmanagers and the whole of society?” to debate the role and benefits of label not only for the nature conservation point of view but also in economic and social terms as well as the issue of private land conservation and its integration in environmental policies at the European, national and regional level. Web: For pictures see our Gallery section under Media. 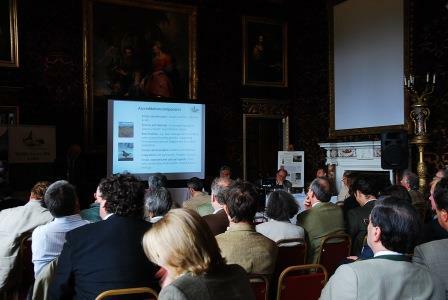 Subject: This year’s WE Plenary Session took place in the beautiful settings of the Holkham Estate. Holkham is a privately owned estate, situated on the north coast of the English county of Norfolk. This estate is currently the only WE Labelled estate in the country. The Palladian style villa in the centre of the thriving 25.000-acre (cca. 10.000 hectares) agricultural estate served as the venue of the 3-days-event. How to implement the WE Label in the EU and in the UK particularly - was at the core of the discussions. 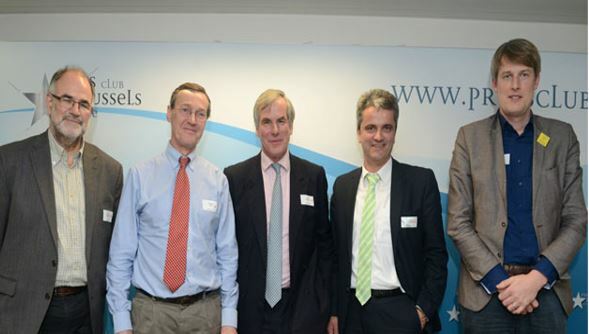 Thierry de l’Escaille (Secretary General of the ELO), Stefan Leinen (EU Commission) and Tom Coke (owner of Holkham Estate) spoke on the first day about the current state of play of the project both at EU and UK level. The second day continued with presentations, which were followed by a discussion on the long term implementation of the project. The discussion counted with additional presentations, namely from Konstantin Kostopoulos, new COO WE, and Christopher Price, Senior Policy Officer from CLA. 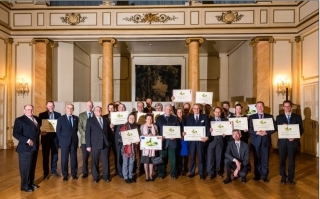 The 3 days also included different field visits around the estate, showcasing Holkham’s multiple activities and future challenges, and the gala dinner where Jakob Frankenhauser, the manager of Kullo Grad, Finland received a WE Label. Subject: 2013’s annual plenary session of the Wildlife Estates Label was held in Prague and Chlumec nad Cidlinou, in the Czech Republic. On September 3rd, the 23 participants arrived in Prague and immediately began their first working session, to discuss the general situation of the WE and its future. Over the next three days a variety of subjects and concerns were addressed, ranging from the appropriate methodology to implement WE principles, to how to support small game on privately managed land. The attendees spent a day at Karlova Koruna Castle, an hour east of Prague, during which they were given tours of game enclosures and hunting grounds. On Thursday the 5th of September, the participants met at the Ministry of Agriculture in Prague, to discuss they ways in which the WE label could be implemented in the Czech Republic. Following Thierry de l’ESCAILLE’s opening statement, members from the WE and the Ministry of agriculture presented their views on greening requirements and equivalence schemes, Natura 2000, and country specific implementation. 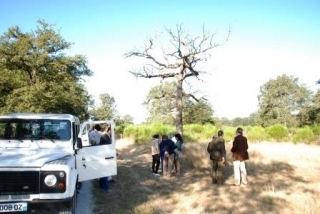 On their final day, WE members embarked on a field visit to the Hamouz Estate where they were shown how to best implement landscape features that also promote biodiversity. 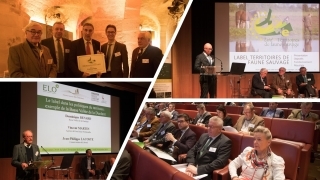 Subject: On the 4-6 September the Wildlife Estates Plenary session took place in Chambord (France). Carlos OTERO, underlined once more that the first intention for the WE label was to reward territories that were already applying a good management but in time the label has been so well recognized it became a tool for land managers to raise awareness about biodiversity, wildlife and the way their good management can improve local habitats for biodiversity. A discussion followed within the working groups on the issue of migratory birds and predation. Delphine DUPEUX, ELO Policy Offcer, presented the results of the study regarding the increase of wild boar population in Europe and the effectiveness of dissuasive feeding on damages to agriculture. She pointed out that the increase of wild boar is similar in percentage throughout all of the countries analyzed by the study. She explained that changes in the average temperatures and increased human activity were identified as the main factors causing the increase in wild boar population. representatives from a series of Wildlife Estates Delegations (Spain, Germany, Czech Republic, Austria, Scotland, Sweden, Denmark, Finland, France, the Netherlands and Belgium) to the Wildlife Estates Plenary session in Lower Saxony, in Germany in order to discuss and progress on the implementation processes of the project. In the meantime, additional experts from universities and governmental bodies were sharing their knowledge and experience. One of the main purposes of the conference was to take a glance into the future and to develop the objectives for the upcoming year 2012. 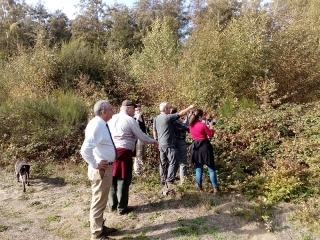 A clear synthesis of the current situation of the project and the definition of strict objectives for the future demonstrated the potential of the Wildlife Estates Label and Network at a European level. New communication tools, such as a web questionnaire for national liaison offices and signboards, were presented to all with the aim to facilitate and develop the cohesion of the network with a common brand and to increase the efficiency of administrative tasks. In addition, the development of this web questionnaire will support the new communication strategy by publishing on the website information about the Wildlife Estates territories and will optimize the organization of the network and keep cohesion between each delegation. The outcome of the conference was undoubtedly positive and the questions discussed set valuable connections between past, present and the future. And above all, cooperation and knowledge sharing among the stakeholders once again witnessed a great impact in setting path for the future improvements. 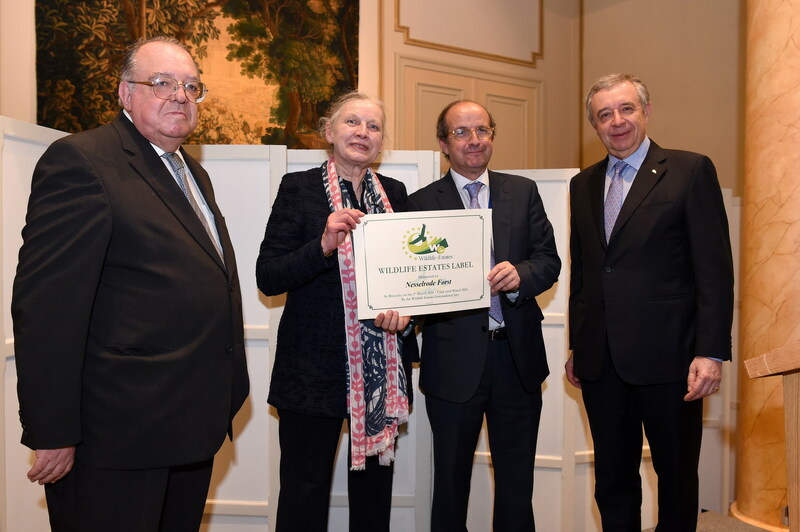 Subject: On the occasion of the Gala Dinner of the Forum for the Future of Agriculture 2019, Nannett Countess of Nesselrode -owner of Nesselrode Forst- received the WE diploma from the hands of -from left to right in the picture- Mr. Konstantin Kostopoulos (CEO of the Wildlife Estates Initiative), Mr. Daniel Calleja Crespo (Director-General for Environment at the European Commission) and Thierry de l'Escaille (Secretary General of the European Landowners' Organization). 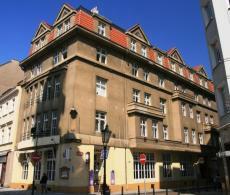 Nesselrode Forst was awarded Wildlife Estates in March 2019. The structure of its forest and its many tree species due to an unconventional management since 1864, the quality of the soil on its arable land, and the presence of black stork and wolf lead to precious ecosystems. Subject: The Wildlife Estates Initiative awarded with its label to 14 Belgian estates with and excellent private management of the nature in their estates, taking into account the surrounding social fabric and culture. Ms. Marleen Evenepoel -CEO of the Flemish Agency for Nature and Forest-, Prof. Philippe Baret -Dean of Agriculture of the University Catholique de Louvain- and Dr. Humberto Delgado Rosa -Director of Natural Capital, DG Environment, European Commission- expressed their support to this initiative with highly interesting speeches. Subject: Près de 80 participants se sont réunis pour participer aux « Rencontres du label Territoires de Faune Sauvage ». Des représentants de l’administration, de la propriété privée, de chambres consulaires agricoles et forestières, des fédérations des chasseurs, de conservatoires, d’ONG environnementales, des parcs naturels régionaux et des agences de l’eau ont pu assister à cette journée et avoir un retour d’expériences sur l’implication des propriétaires privés et de leurs ayants-droits comme les chasseurs et les pêcheurs dans la protection de la biodiversité, en cohérence avec les objectifs de Stratégie Nationale de la Biodiversité. Merci à tous les participants et à tous ceux qui ont montré de l'intérêt pour le label. 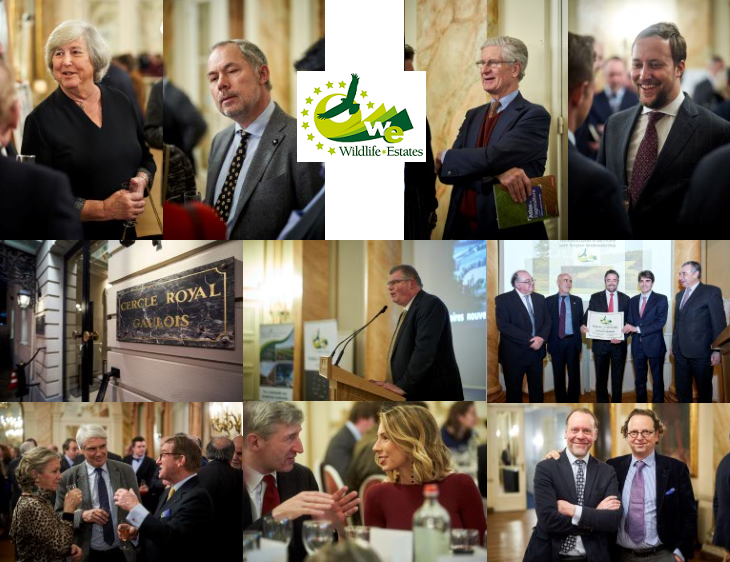 Subject: On Monday, February 5, at the Cercle Gaulois in Brussels, the Wildlife Estates Labels were presented to 12 Belgian private owners with special merits in the field of development for fauna and flora. 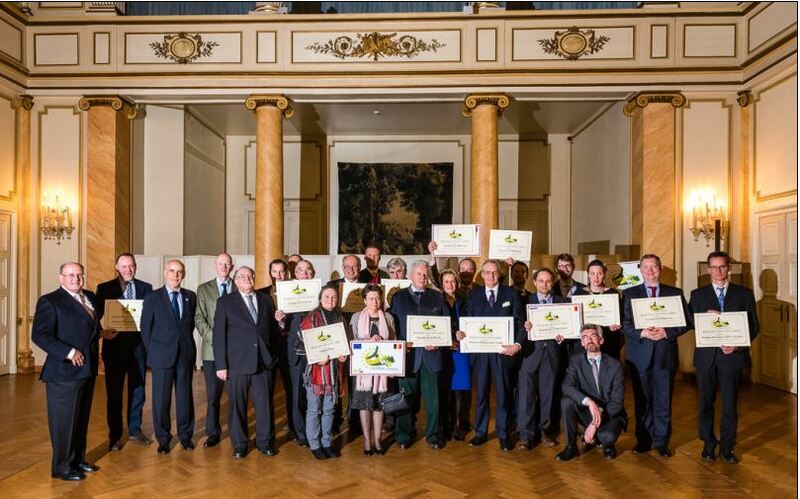 In the presence of Humberto Delgado Rosa (Director-General for Environment, European Commission), Konstantin Kostopoulos (CEO Wildlife Estates) and Carlos Otero (chairman of the European scientific committee of the WE-label), a total of 12 Belgian private domains received the label. In Belgium 20 areas of private conservation have been awarded the label in total, covering over 18,500 hectares. Landowners and –managers from the estates received their WE Label at a press conference in Paris organised by the François Sommer foundation, the National Hunting and Wildlife Agency (ONCFS) and the National Hunting Federation (FNC). Thierry de l’Escaille, Secretary General of the European Landowners’ Organization, started the press conference by presenting the origin of the label in 2005 and its development. Philippe Dulac, President of the François Sommer Foundation, Alain Durand, Vice-President of the FNC, and Nirmala Séon-Massin, Deputy Director of Research and Expertise at ONCFS, explained individually why their organisations have joined this project . 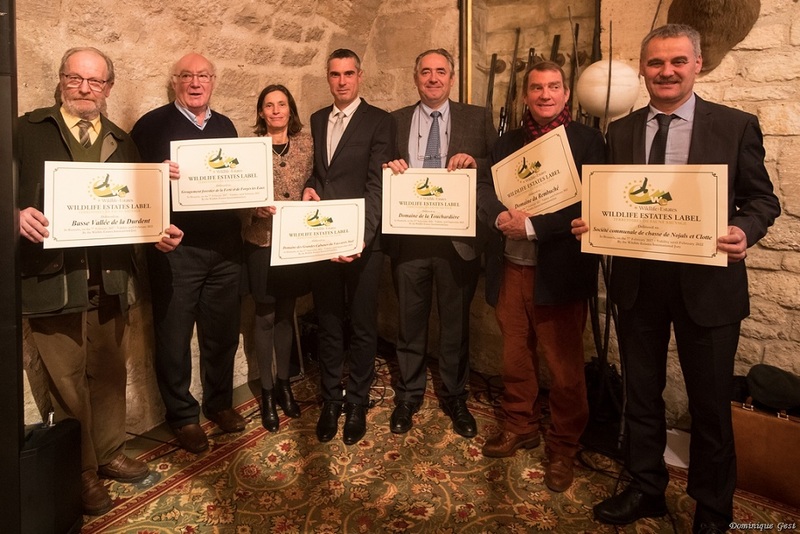 Read more about our new French members in our Wildlife Estates Newsletter! Join us for the next event of WE France in Normandy when a movie on the WE Label in France will be published. Save the date: the 19th of May, in Veulettes-sur-Mer, in Normandy, one day dedicated to the WE label! Subject: The third meeting of the Czech National Steering Committee took place in Prague, at a local Association of Private Farming (ASZ) in the Czech Republic. The meeting was led by Francesco Kinsky dal Borgo and his new assistant Kamila Lohrova, both from the European Landowners’ Organization (ELO). Several members of the Czech National Steering Committee joined the meeting in order to discuss aims and methodology of the Wildlife Estates (WE) Label in the Czech Republic. Communication of the project and preparation for next development of the WE Label is rather at its begging. However, during the meeting several important steps were discussed, and the Czech National Steering Committee confirmed to continue working on the application and promotion of the WE Label in the Czech Republic. 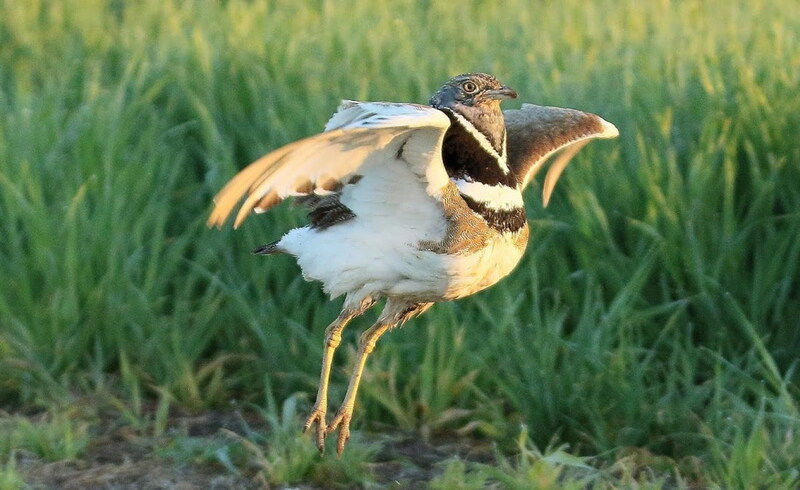 Subject: 2018 has seen European Landowners' Organizaion flag-ship biodiversity initiative expand rapidly, with local Wildlife Estates office being set up in several countries across Europe. These national delegations have now been trained in the principles and methodologies that underpin the WE label criteria. WE evaluators from Bulgaria, the Netherlands and Italy were present, as well as the Scientific Committee member, Dr. Tudor Stanciou, who is our expert on the Pannonian bioregion, and the new project coordinator, the Eng. Gerardo Gil de la Calle. 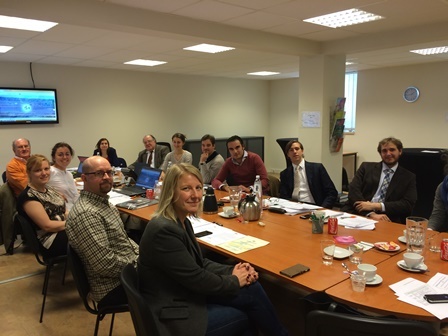 The purpose of the workshop was to ensure that a standardized assessment method is being applied across all European countries. Subject: The first WE Label Evaluator Training Course at EU level was led by Carlos Otero and Maria Ledesma from the Polytechnic University of Madrid. More than 10 people joined the training session mainly representing different National Delegations to obtain more insights of the WE assessment methodology and the requirement for the European Evaluator Diploma. At the end three delegates, who had already acquired experience in the evaluation of the estates, received their official diploma: Ahti Putalaa from Finland, Fransesco Kinsky dal Borgo from Czech Republic and Alvaro Martínez Serrada from Romania. 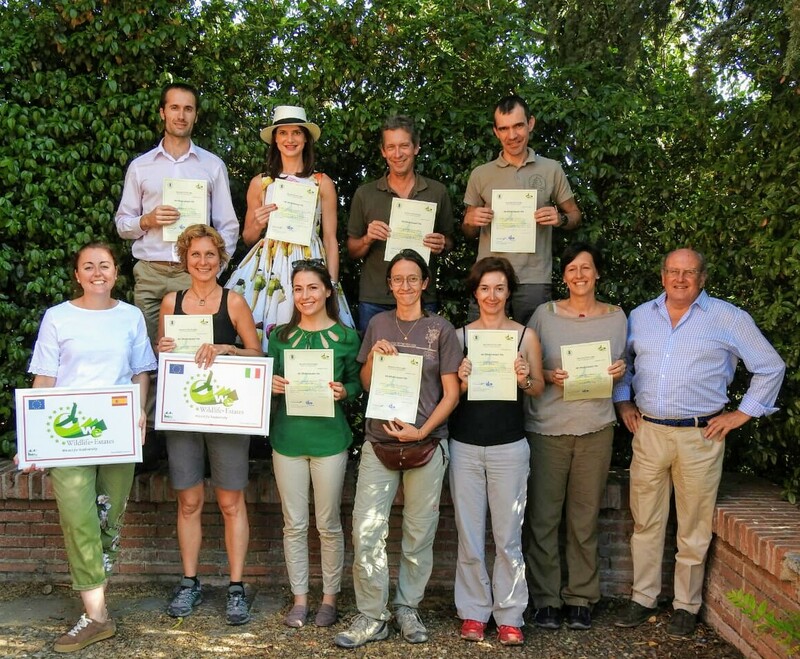 The WE European Official Evaluator title is given upon the completion of the training course given under the auspices of the Wildlife Estate European Secretariat and the Superior Technical School of the Engineers de Montes (The Polytechnic University of Madrid). The title will be renewed every year.